He loves art, music, and computers and has written several songs. At age twenty-four (at the time of this writing), he is deeply concerned about people his age and the world they are inheriting. The Karmapa ensures the continuity of the Kagyu lineage and the transmission of the authentic Mahamudra teachings. As Barry Boyce tells us in this 2010 feature, this young man’s views will help define Buddhism in the 21st century. On the day his first visit to America was suddenly announced, I booked a ticket. After the Dalai Lama and the Panchen Lama, His Holiness the Seventeenth Gyalwang Karmapa (“the Karmapa,” for short) is the third most important spiritual leader in the Tibetan Buddhist hierarchy, and the one who may carry that tradition forward in the twenty-first century. I rearranged my schedule and jumped through some hoops to make the trip, but my little journey was nothing compared with his. 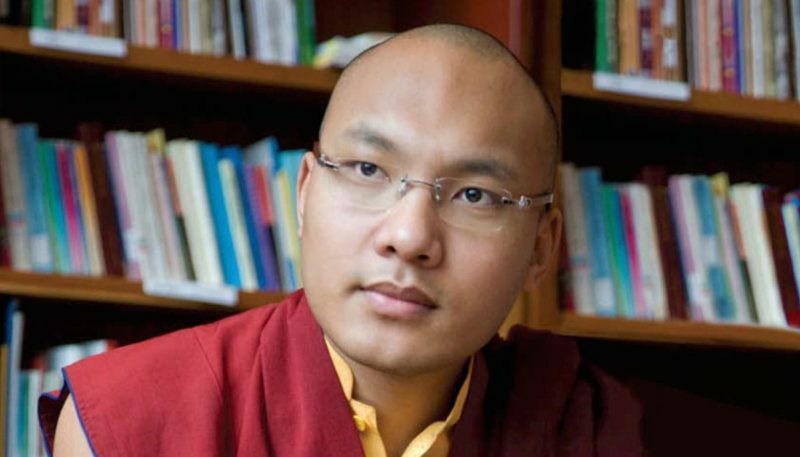 In 1999, at the age of fourteen, the Seventeenth Karmapa, Ogyen Trinley Dorje, made a stunning escape from Chinese-controlled Tibet that attracted the world’s attention, and the eyes of the world have remained on him ever since. The Dalai Lama has hosted him at Gyuto Monastery in India since his escape, and is thought to be preparing him to continue his global message of peace, cooperation, and human kindness. But what has made the Karmapa even more interesting is that he’s not afraid to rock the boat: he talks about the environment, vegetarianism, and the role of women—and how Buddhist institutions needed to align themselves more with the modern world on these issues. His youth contrasts markedly with the grandfatherly countenance of the Dalai Lama, and he has decades of work ahead of him, time to have a real impact on the world of my children. As I sat in the cavernous Hammerstein Ballroom in midtown Manhattan waiting to hear his first public pronouncement in America, I wondered, What kind of a person is he? Will his voice resonate with people of a younger generation? How will he bring together his ancient spiritual tradition and his concern for the problems of today’s world? The first sight of him was deceptive. He peered out into the spotlights, unable to make out the face of even a single person in the crowd of three thousand. He looked his age — twenty-three — with an attractive face and manner and an inquisitive mien. Of course the crowd was predisposed to like him, but still they seemed taken by his innocent demeanor. He didn’t appear to be shielded from the world by the solemn mantle of spiritual leadership. He was dwarfed by the monumental wall hanging of the Buddha behind him, and as he started to speak I felt certain he would be timid and intimidated. Who would not be, had they arrived the day before on a direct flight from India and faced a throng of twitching and buzzing New Yorkers. I expected to hear the tentative musings of a twenty-something who had led a controlled and isolated life. Maybe an orthodox recitation of traditional Buddhist categories. He was young, and perhaps not yet inhabiting his exalted role. I’d be all right with that. 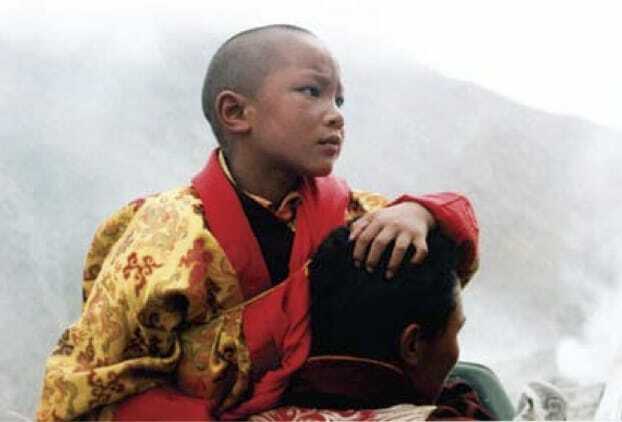 The young Karmapa on his way to Tsurphu monastery after his recognition in 1992. But then he spoke, for the first time ever to a Western audience. He was gentle and genuine, yes, but not tentative. He knew his mind. Far from isolated, he appeared as someone who understood the DNA of the world and could speak with some authority to anyone, anywhere, anytime. Orgyen Trinley Dorje was not playing a part, falling back on rote rhetoric and tidy doctrines. In the several days I heard him speak and spent time in his presence, he did not cling to dogma or judgment. He spoke plainly, from the heart, about his experience of mind and life, almost like a New York cabbie telling you what he thought about things while still keeping his eye on the road ahead. Spiritual authority in Tibetan Buddhism is commonly vested in tulkus, masters who consciously take rebirth with the intent of helping others, as tradition says the Buddha did himself. Generally recognized when they are children, they’re trained in Buddhist philosophy, ritual, and meditation to carry on the lineage of their predecessors. So far there have been seventeen Gyalwang (“Victorious”) Karmapas. Theirs is the Kagyu lineage of Vajrayana Buddhism. It is called the “ear-whispered” or practice lineage, because of its emphasis on meditation practice and direct, personal transmission from teacher to student. Closely associated with the Nyingma school of Tibetan Buddhism and its famed practice of Dzogchen (the “Great Perfection”), the Kagyu lineage specializes in the ancient teachings known as Mahamudra, the Great Seal. The Kagyu lineage can be traced back more than a thousand years to a wild Indian yogin named Tilopa. He passed his realization of Mahamudra on to his principal student, the scholar Naropa, who in turn transmitted it to the Tibetan translator and farmer Marpa. Marpa’s leading student was the cave-dwelling ascetic and Tibetan national poet Milarepa, whose principal student was Gampopa, a monk and physician who established the first Kagyu monastery. Gampopa’s most significant student was Tusum Khyenpa, whose contemporaries gave him the title Karmapa, “the man of Buddha activity.” Tusum Khyenpa decided that the best way to ensure the continuation of the lineage was to leave behind a letter telling the monastery how to find his next incarnation, who would then be installed as head of the lineage after a period of regency. The second Karmapa thus became the first formally recognized tulku, creating a system for maintaining continuity of the teachings that became widespread in Tibet. It is the Karmapas’ role to ensure that the transmission of the practice lineage remains fresh and intact, not so much by being a good leader, which is important, but mainly by embodying the spirit and realization of Mahamudra’s true meaning. The actual experience of Mahamudra is beyond words, but Tilopa offered a pithy summation: “Mahamudra mind dwells nowhere.” It’s called the “Great Seal” because all that exists—good and bad, suffering and enlightenment, the beginning of the path and its fruition—is “sealed” with the mind’s true nature, which is empty, aware, and blissful. Contemplating the Seattle skyline during his first U.S. tour. Photo by James Gritz, (c) Karmapa Foundation. Such simplicity is born from extensive study, instruction, and practice, and over the centuries, the Karmapas acquired a reputation as highly adept meditation masters with a powerful presence and a palpable sense of caring for everyone they encountered. Until the Sixteenth Karmapa made his first trips to the West, this reputation was largely limited to Asia. His visits to the United States in 1974, 1976, and 1980 were whirlwind affairs, with large groups of monks and fellow teachers journeying through Disneyland, the Capitol Building in Washington, Hopi Indian lands, and untold venues large and small. Many students like me fell in love with the Sixteenth, for his abundant warmth and playfulness. He died at fifty-seven, having spent the last twenty-two years of his life outside Tibet. The person now known as the Seventeenth Karmapa began life as Apo Gaga, a boy born in 1985 in a poor nomad family in Chinese-occupied eastern Tibet. By then Tibetan monks had already started to search for the Sixteenth Karmapa’s reincarnation. In 1992, at the age of seven, with the Dalai Lama’s blessing, Apo Gaga was declared to be the Karmapa tulku. After his recognition, the young boy was installed at Tsurphu Monastery in Tibet, the Karmapas’ ancestral home. He underwent the traditional training and education of a tulku and also oversaw the rebuilding of the monastery, which had been almost destroyed during the Cultural Revolution. 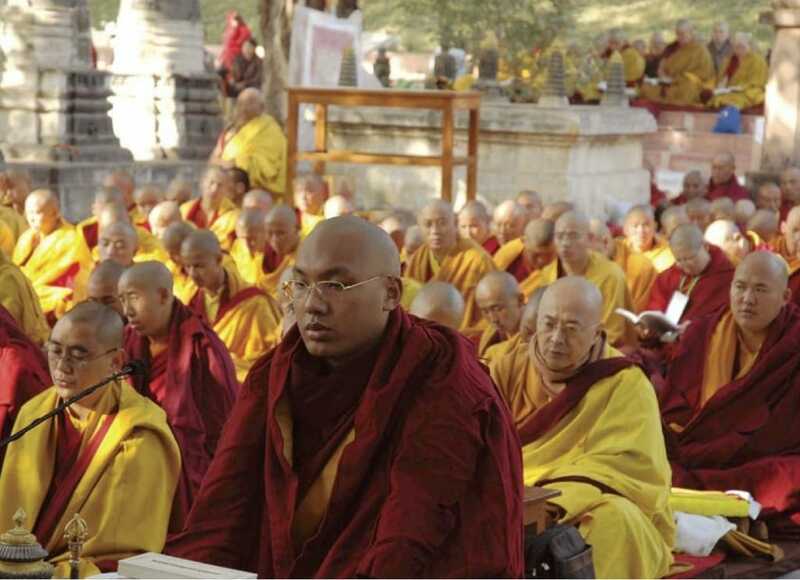 Despite the government’s apparent support, it eventually became clear that the Chinese would not allow the Karmapa access to the teachers and teachings he would need to fulfill his role. He resolved to leave Tibet. 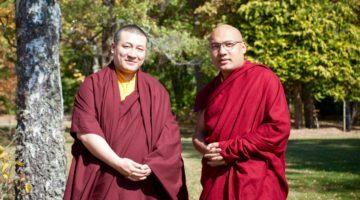 On December 28, 1999, the Karmapa pretended to go into retreat, but instead he dressed in civilian clothes, left the monastery, and began a secret and elaborate journey by car, foot, horseback, helicopter, train, and taxi. Seven days later, he arrived in Dharamsala, India, seat of the Tibetan government-in-exile, and was greeted by his holiness the Dalai Lama. Like his predecessor, who had escaped Tibet in 1959, another Karmapa had emerged into the wider world. Officiating at the annual Kagyu prayer festival in Bodhgaya, India. Photo (c) Tsurpu Labrang. The seventeenth Karmapa, however, entered the modern world at a much younger age than the sixteenth did. He is fluent in Chinese and is learning English rapidly. While the sixteenth loved birds, and seemed to be able to communicate with them, the seventeenth’s hobby is books. He loves art, music, and computers and has written several songs. He plays video games. At age twenty-four, he is fifty years younger than the Dalai Lama, and is deeply concerned about people his age and the world they are inheriting. All of the Karmapas have adapted to the circumstances of their day, to ensure that the teachings remain fresh and timely, but the seventeenth, who is coming on the scene during the digital revolution, the age of global climate crisis, and the mashing and muddling of cultural identities, must find his place in a world of rapid change his predecessors in isolated Tibet could hardly have conceived of. 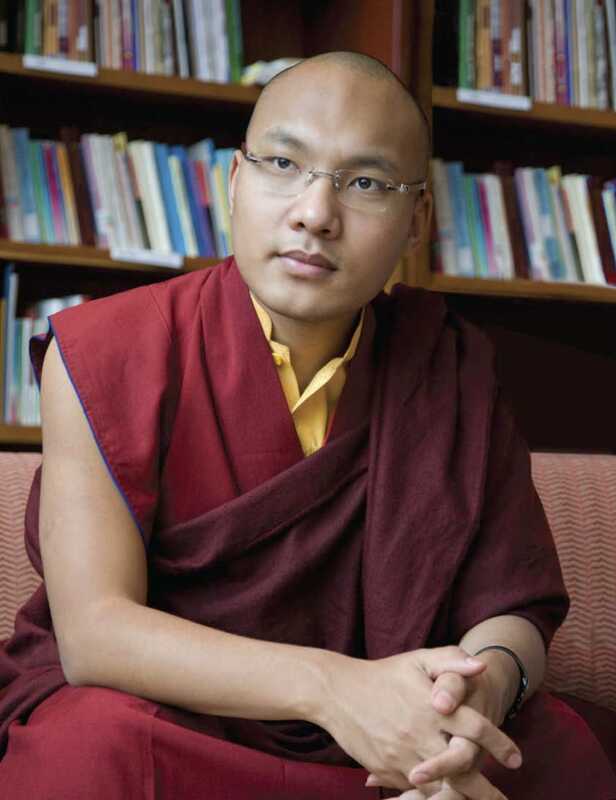 Ultimately, the Karmapa has said, he would like to be “a twenty-first-century religious leader,” spend two months a year in the united states, and reach people beyond those of his own faith. At present, he is a guest of the Indian government, which so far has been conservative concerning his travel plans, and his 2008 U.S. tour is still the only time he has traveled outside the subcontinent. His monastery is open to visitors, however, and his website supplies information on how to come and see him. He also gets out and about in India, visiting and teaching a variety of groups. World, we live and die on your lap. On you we experience all our woes and joys. You are our ancestral home of old. Forever we cherish and adore you. 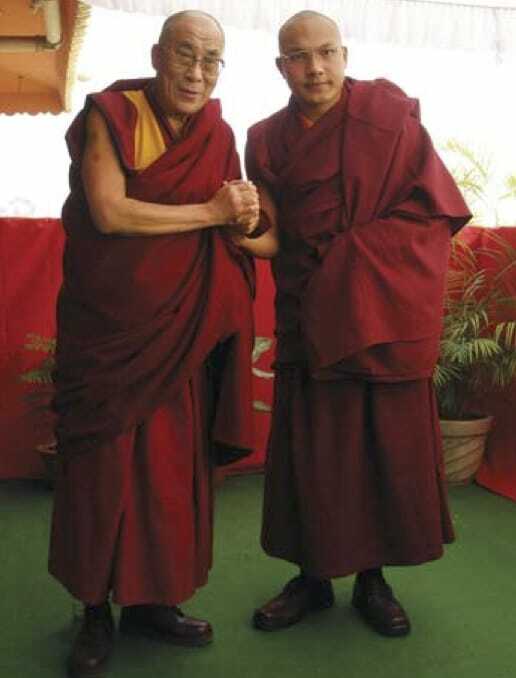 With His Holiness the Dalai Lama. Photo (c) 2006 Tsurpu Labrang. There is a word for this kind of talk in Tibetan, Michele Martin told me. “It’s called danzig.” it means straightforward speech, telling it like it is. Concrete action in the world—how you live and what you do for others—is very important to the Karmapa, and so is setting an example. He became a vegetarian and declared that Kagyu monasteries outside of Tibet would change to a vegetarian diet. 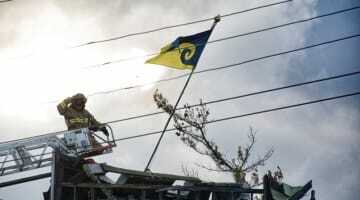 On his most recent birthday, he asked followers to forgo an extravagant celebration and instead distribute ecofriendly trashcans and mattresses to fifty organizations and schools and plant trees around the monastery where he lives. Yet he doesn’t carry that heavy weight ponderously. In New York he spoke of the world and all our cares as an enormous weight, and our mind as a clear mirror that can reflect the image of the weight without the immense gravity. More than his ideas and causes, it is the incredible lightness of his being that people seem drawn to. He listens to hip-hop on an iPod. He lets go of traditional forms when they don’t fit the cultural context, including joyously receiving a bear hug (an unheard-of breach of Tibetan protocol). He erects none of the barriers that often exist between religious leaders and regular folks. As he was leaving America, he talked about what it was like to grow up from such a young age in the confines of his training and how delighted he was when someone from the West brought him a toy. But at a certain point he realized that his attachment to getting toys was silly. He didn’t need toys. What truly made him happy was just being with people and doing whatever he could to make them happy. He says he has no personal life, no private life, and he doesn’t need one. Barry Boyce is a professional writer and editor who was longtime senior editor at the Shambhala Sun. 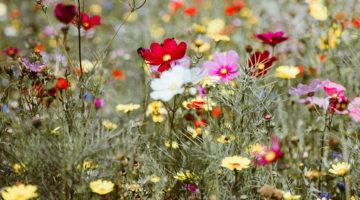 He is editor of, and a contributor in, The Mindfulness Revolution: Leading Psychologists, Scientists, Artists, and Meditation Teachers on the Power of Mindfulness in Daily Life (2011). He is also the co-author of The Rules of Victory: How to Transform Chaos and Conflict—Strategies from the Art of War (2008).